K-On!! episode 1 review; cute girls doing cute things and I’m fine with it. This episode begins with Yui arriving at the school early and heading up to the practice room to work on her skills, and once the other girls arrive we find out that Yui got her wake up time wrong again. After the new OP we find out that it’s the beginning of a new school year, Azusa is now a junior, and the other girls are seniors. After Yui makes some small talk about being a senior the girls head to the class assignment board to find out where their home rooms are. Well, Yui pushes her way through the crowd to discover that all four of the girls are in class 3-2, and Mio sheds tears of joy. Once the girls see that even Nodoka is in the same class, Mio wonders if the fix was in. Mio’s question is soon answered when they discover that their homeroom teacher in none other than Sawako. Later, in the hallway, Sawako confirms Mio’s suspicion and girls all express their thanks before being sent to the welcoming ceremony. During the welcoming ceremony we’re treated to the student body singing the school song, and a strong motif of the segment is falling cherry blossoms. Also, Nodoka reminds Yui that the club needs to find new members so Azusa won’t be all alone next year. The club concentrates on trying to get new members, passing out fliers, wearing costumes but to no avail. The club redoubles their efforts to get new members by trying all sorts of sneaky tactics and even resort to observing other clubs. Back in the club room, Sawako and Nodoka join the girls and they plan for tomorrow’s performance at the orientation ceremony, and Yui hopes someone will join the club after hearing them play like Azusa did. 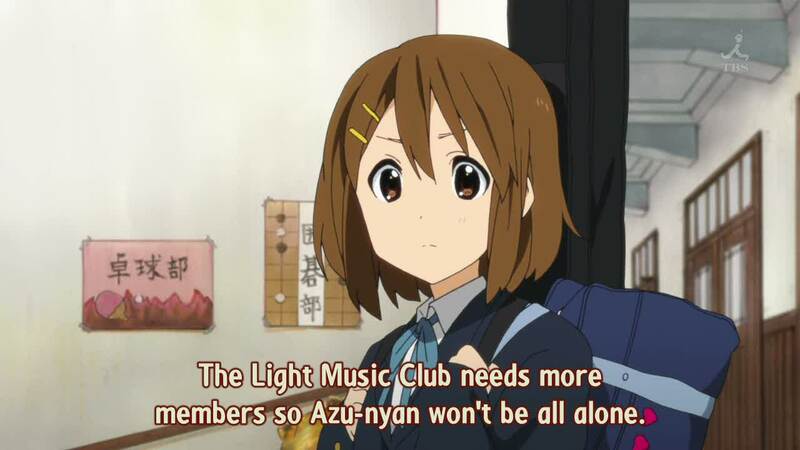 Before their performance, Yui makes a pitch to get new members to join the club, and we only see the last few seconds of the show. Later, the girls feel their show went great and they head off to pass out fliers. After no one shows up to the club Azusa tells her other friends that the club must not be popular but they tell her the club looked awesome, and they heard some freshmen say so. 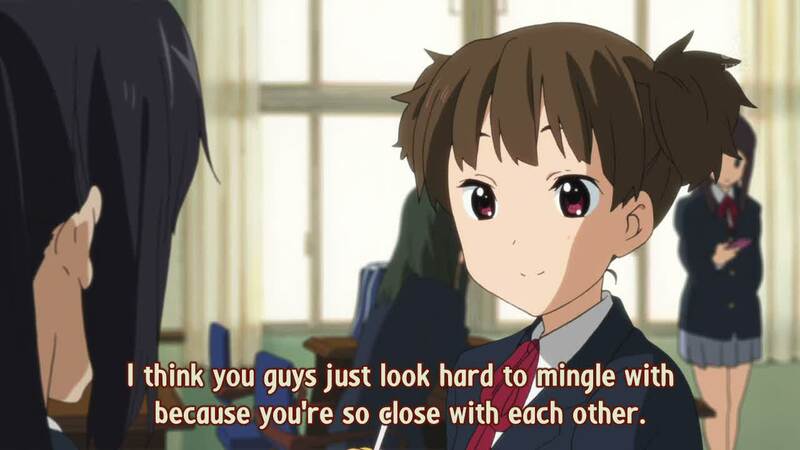 They tell Azusa that the problem is they might appear too hard to mingle with because they seem so close. 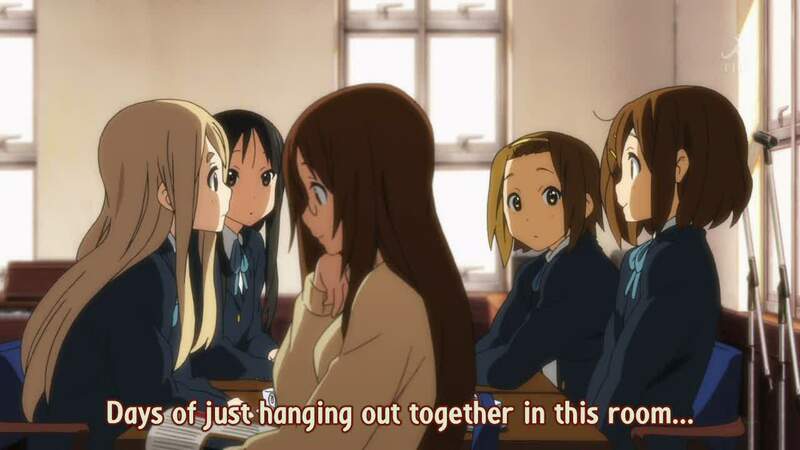 While Azusa is with her friends, the other four brainstorms about how to get new members and Yui says it’s OK like this for a while longer with just the five of them. Sawako reminds them that they only have this year; Yui says it’s a long time but Sawako says a year is really short; Azusa overhears this conversation and seems happy. As the girls are about to dig in to some snacks Azusa walks in and Yui is about to rush out to continue passing out fliers but Azusa stops her. She asks for some tea and the Banana cake Yui felt Azusa wanted, and she tells the other girls that she’s fine with this year just having the five of them. 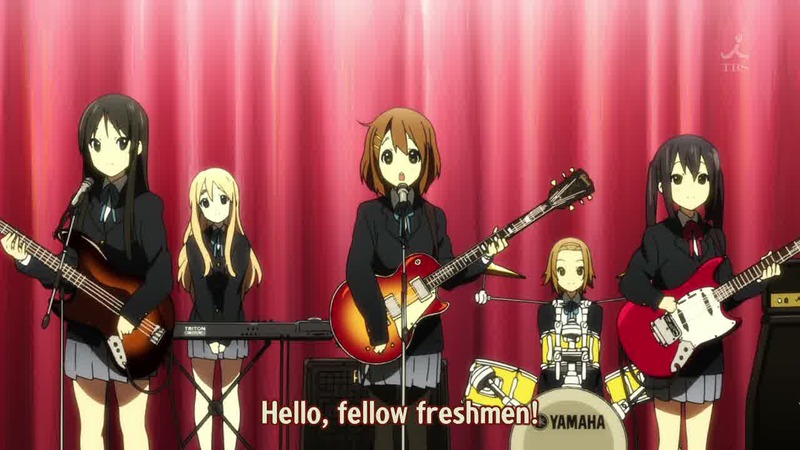 Azusa tells Yui that she’s not going to go easy on her this year, and Yui pleads to the sky for a freshman to save her. Then we get treated to a new ED song and animation, and that’s all for this episode. Well, theirrrrrrrrrrrrrrr back, cute girls doing cute things for my male amusement, and I love it. Yes, I can’t deny it, Lucky Star, Sora no Woto, and K-On! what can I say, I love watching cute girls doing cute things. The world could be ending and all I would need is a couple of beers and a good dose of Tsukasa, Kanata, and Yui and I’d feel fine. OK, the new series gives us a new OP and ED, I think the new OP featuring Yui’s vocals is all right but not great, and the new ED featuring Mio’s vocals is good, but neither is as good as the first season’s OP or ED. 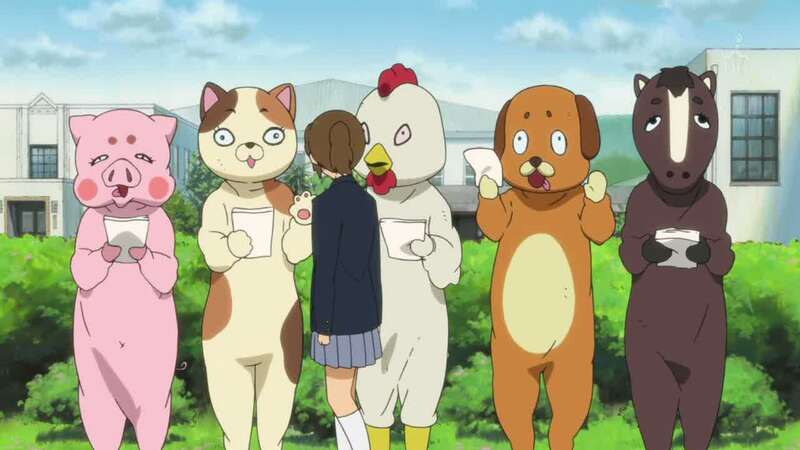 While the first episode of second season pretty much follows the same formula as the previous season there are some differences, the first season began with Yui’s frantic rush to make it to her first day of high school on time which could be viewed as Yui’s unorganized, disjointed, and chaotic journey towards the future and maturity. But, the way Yui started the second season infused the episode and the start of the second season with a totally different flavor, and I tasted a strong dose of mono no aware along with a hint of melancholy. While Yui and the other girls are still moving towards their bright futures, whatever they may be, Yui who’s been the most emotionally receptive of the girls is realizing that an important chapter of their young lives is about to come to a close. 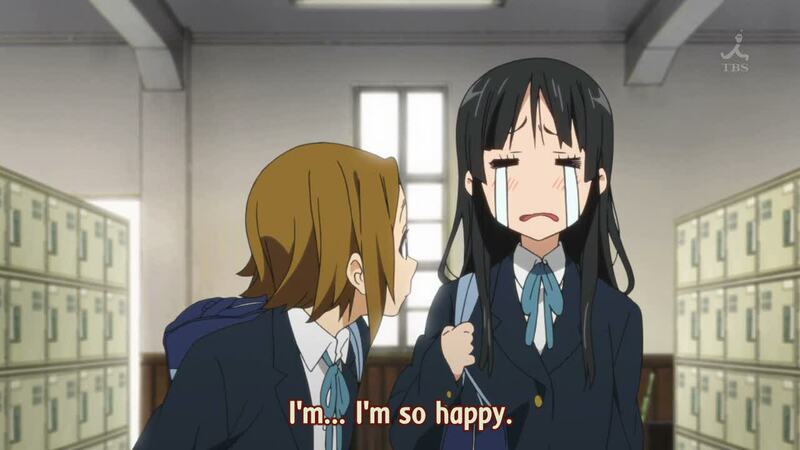 I don’t really know if Mugi, Mio, and Ritsu understand how close the five of them are but Yui understands this and Azusa was made aware of how close they all are to each other by her friends telling her how other girls view their group. While the second season might have all the silly stuff from the first season I think the series is going to become more focused on the girls’ relationships with one another and we’ll see a pretty heavy dose of introspection before it’s all over. Good animation, good music, a few laughs, and cute girls doing cute things, that’s good enough for me. I don’t remember the show having so many jokes fall flat, or maybe it’s just not as fresh and interesting to me. Nonetheless, it looks smooth and bright and the cuteness is still very cute. Maybe it’ll pick up when the new girl arrives. It was always like that Ghosty. I’m sure you don’t like being thought of as a hater, but you behave like one. keep hatin’ you hater. hating on a show like this is pathetic. you’ve always been like this. Yes, some of the jokes did fall a little flat but I feel comfortable spying into the lives of Yui, et al. I guess it’s a bit of nostalgia for those high school days that only exist in my dreams. 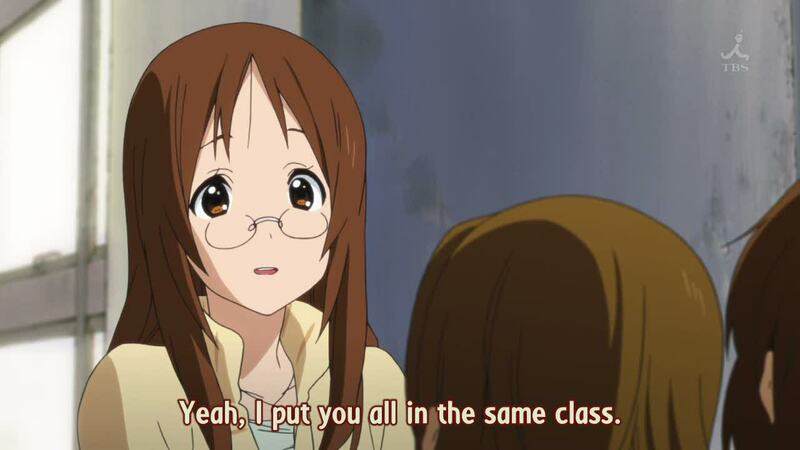 Basically, I like watching the K-On! girls just being the silly and cute girls that they are, and think about how I’d like to take a ride in an hot tub time machine, go back to high school age, and travel to K-On! land and bang each of those girls. am glad the girls are back . . . i love them so much i almost thought of them as my little girls . . . heck i still have their songs at the front of my iPod’s songlist after all this time . . .
trouble is why did the animators skip the girls’s second year & jumped to their third year??? i know about the challenge of finding someone to succeed them after graduation but they should have resorted to the girl’s high school life first . . .
and mio’s still the hot one . . . Sorry, Yui’s the one for me. I think that the first series covered 1 1/2 years of school and the 13th dvd episode took the girl through their second news years together. So, I guess it’s only logical to start the second season with the start of their third year. ah its not good, better try this http://www.daceband.com/view-album/1710/bispak-tahun-ini its wonder hot woman,, got it! I’ve learn this submit and if I may just I want to counsel you few fascinating things or tips. to this article. I wish to learn more things approximately it! etc. in a blue moon” opportunity to literally get in on the. It’s nearly impossible to find well-informed people in this particular topic, however, you seem like you know what you’re talking about!